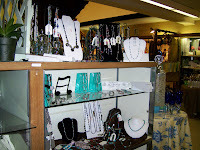 Jewelry By Chaddock: My Under One Roof booth! My necklaces are now on display and available for purchase at Under One Roof in Abilene, Texas. This is a picture that was taken after we finished setting up. Click on the picture to get a full blown, nice big view! I've already sold several items.. well, at least three. But I've only had it up 3 business days. I'm hoping that's a good sign!